Dubai, UAE, January 19, 2019: The Belgium 20-year-old, Jasper Philipsen, a new signing for the team this season, only needed five days of racing to take his first win in UAE Team Emirates colours. That came in Strathalbyn, Australia after 149.5km of racing from Glenelg in the Tour Down Under’s fifth stage. 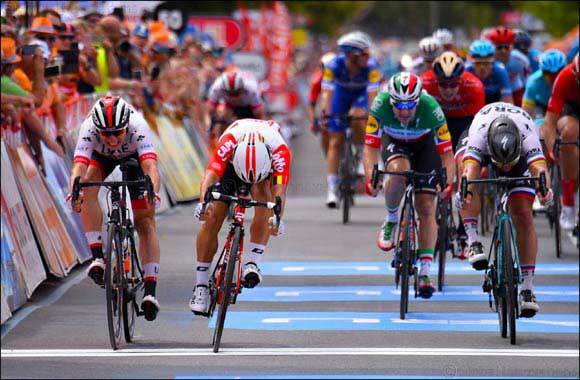 Philipsen was not the first rider over the line, instead it was Caleb Ewan (Lotto-Soudal). However, the jury relegated Ewan to the back of the pack for an irregular sprint and gave the honours to Philipsen, second over the line. “It’s an important victory for me, my first WorldTour race, but it arrived in a strange way, so I missed that feeling of crossing the line first. Still, success is always beautiful and I’m very happy to have taken it,” Philipsen said. “The final, just like in the past days, had a lot of movement. There was a good fight for position and a crash, but I was in good position for the last curve. I feel that I have strength and spark, and like that I was able to release a good sprint. Thanks to the team and the sponsors who brought me into this team. And to all my team-mates for the constant support that they have given me“. Philipsen arrived ahead of former World Champion Peter Sagan (Team Bora-Hansgrohe) and Danny Van Poppel (Jumbo-Visma). UAE Team Emirates remains at the top of the team classification, while Jan Polanc climbed to fifth place overall at 26″ from leader Patrick Beven (CCC). Diego Ulissi sits 11th at 26″ and Pogačar 14th also at 26”. The last stage on Sunday arrives on top of Willunga Hill, which will decide the final overall of the Australian stage race. 3 Danny Van Poppel (Team Jumbo-Visma) s.t.